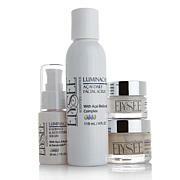 Trio of products providing a powerful hydration boost to drier skin types. Apply a light layer of Royal Beauty Day Cream to face and neck in the morning, following serums. Apply a light layer of Queen of Beauty Night Cream to clean skin in the evening, following serums. Apply a few drops of Bio-Skin Function Oil prior to Royal Beauty Day Cream and Queen of Beauty Night Cream and gently massage into face and neck. 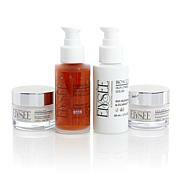 ELYSEE BIO-SKIN FUNCTION OIL 10 ML. Ingredients: Decyl Oleate, Hexyl Laurate, Persea Gratissima (Avocado) Oil, Olea Europaea (Olive) Fruit Oil, Triticum Vulgare (Wheat) Germ Oil, Royal Jelly, Fragrance, Helianthus Annuus (Sunflower) Seed Oil, Daucus Carota Sativa (Carrot) Seed Oil, Daucus Carota Sativa (Carrot) Root Extract, Beta Carotene, Zea Mays (Corn) Oil, Retinyl Palmitate, Cholecalciferol, BHA, Propylparaben. 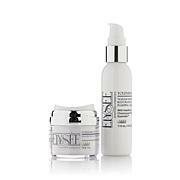 ELYSEE QUEEN OF BEAUTY NIGHT CREME 1.7 OZ. Ingredients: Petrolatum, Water, Lanolin, Olea Europaea (Olive) Fruit Oil, Sesamum Indicum (Sesame) Seed Oil, Beeswax, Royal Jelly, Cetyl Alcohol, Sodium Borate, Fragrance, Methylparaben, Propylparaben, Potassium Hydroxide. ELYSEE ROYAL BEAUTY DAY CREAM 1.7 OZ. Ingredients: Water, Glyceryl Stearate, PEG-100 Stearate, Pentapeptide-48, Hydrogenated Lecithin, Glycerin, Butyrospermum Parkii (Shea) Butter, Phenethyl Alcohol, Ethylhexylglycerin, Maltodextrin, Olea Europaea (Olive) Fruit Oil, Sesamum Indicum (Sesame) Oil, Disodium Phosphate, Acetyl Hexapeptide-8, Sodium Phosphate, Caprylyl Glycol, Passiflora Edulis Seed Oil, Cetearyl Alcohol, PEG-40 Castor Oil, Sodium Cetearyl Sulfate, Cetyl Alcohol, Royal Jelly Extract, Decyl Oleate, Petrolatum, Beeswax, Carbomer, Allantoin, Aloe Barbadensis Leaf Juice, Propylene Glycol, Diazolidinyl Urea, Methylparaben, Propylparaben, Triethanolamine. 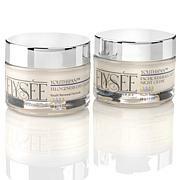 ELYSEE heritage dry skin bio-skin (is a cream) to describe silky smooth - perfect for dry skin and in winter. Great face cream, so creamy and thick. I put small pats on my face and let my skins temperature start to melt the product. I then gently massage into my face. It goes on so smoothly, is very moisturizing and feels especially nice in the cold, winter weather. This will last a long time and I'm very pleased with results. The face oil with roller ball is great also. I put this on first, allowing to absorb in, then apply the face cream. It would be nice to be able to purchase this separately too. Easy to use, love the way my skin feels and looks, you need to use such a small amount.and get such great results. Anything By the AMAZING LINDA MARSHALL! 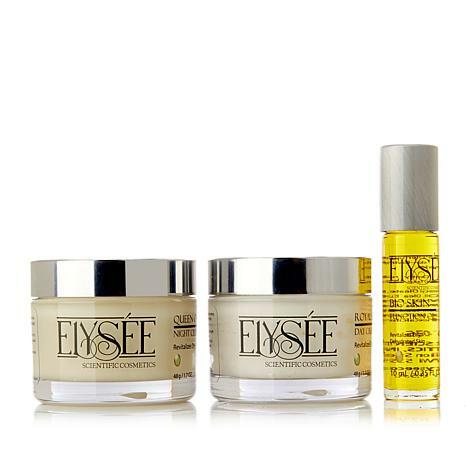 ELYSEE PRODUCTS ARE FAB, BUT THE WOMAN BEHIND THEM IS IMO MUCH MORE FAB! I HOPE I LOOK AS GREAT AS LINDA MARSHALL WHEN MY TIME COMES, IN ALL HONESTY, I MAY BE YOUNGER, BUT LINDA LOOKS BETTER THAN I DO! I BOUGHT THIS TRIO FOR MY SUPER DRY SKIN & LOVE IT! BEEN USING DAY & NIGHT & MY SKIN FEELS SO MUCH BETTER, WISH IT WOULD HAVE BEEN OFFERED ON AUTO-SHIP. I USE OTHER ELYSEE PRODUCTS (PRAI TOO) & HAVE FOUND EACH OF THEM DELIVER, NO HYPE, JUST STRAIGHT UP AFFORDABLE SKINCARE, THX HSN! Signature Club A Argan Oil & Baobab Super Size Trio Take your skincare to-go with this super sized trio of mega moisturizing argan skin care products. Creams, serums and capsules come together in a super size pack of three to bring your skin the best in nourishing hydration. What You Get 2.